But the president is unlikely to stand in the way of the electric car giant's plans, analysts say. 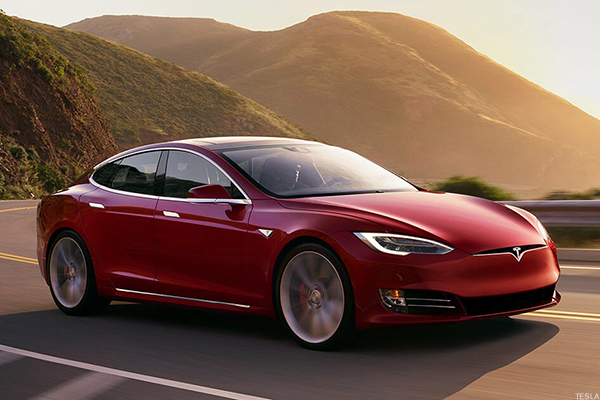 Tesla Inc. (TSLA - Get Report) appears close to making major headway in a huge potential market, but the reported move doesn't come without some risks. The electric car giant is close to securing an agreement with officials in Shanghai that would allow Tesla to build its first production facility in China, Bloomberg reports, citing sources close to the situation. Tesla could announce the deal as soon as this week. Representatives from the company weren't immediately available for comment. Shares of Tesla finished up 0.6% to $372.24 on Tuesday. The stock has surged 73.6% so far this year versus the S&P 500's gain of 9.2%. In securing a deal, Tesla would capitalize on one of the fastest growing markets for electric cars in the world. Approximately 27% of Chinese consumers are considering buying electric cars, up from just 1% in 2012, while 25% are interested in purchasing plug-in hybrids, according to research from Nielsen. Tesla demand in China is soaring. In 2016, Tesla sold 10,399 cars in the region, marking a 182% increase year-over-year and representing 14% of global deliveries, according to equity research firm JL Warren Capital. The company started selling its Model X electric crossover in June 2016, which served as one catalyst for demand, but the firm also cited Tesla's new marketing and promotion strategies targeting Chinese buyers. Tesla has yet to launch the Model 3 in China, but JL Warren anticipates that demand for the smaller, more affordable sedan model will be strong. Tesla on its way to China? The company will most likely need to establish a joint venture with a local partner in order to set up shop in China. Tesla may be able to find a partner in Chinese internet giant Tencent Holdings Ltd (TCEHY , which just revealed that it purchased a 5% stake in Tesla for $1.78 billion. According to an SEC filing made public in late March, Tencent had scooped up 8,167,544 shares of Tesla, making it the second largest investor in the company behind CEO Elon Musk, according to FactSet. Tencent will help "open up all the doors" for Tesla in China, said Ross Gerber, CEO of investment firm Gerber Kawasaki, adding that the WeChat parent company might be interested in forging a joint venture. "Tencent isn't in manufacturing like that, but these guys are smart and will look at it as a tech play," Gerber explained. "I think Tencent will only get closer and closer with Tesla." Not everyone is likely to back Tesla building up a presence in China, however. President Donald Trump has been a vocal opponent of U.S. firms opening production facilities overseas and has warned of imposing a substantial border adjustment tax, which would tax imports and exempt exports, against any companies who try to do so. Trump also featured "America First" policies as the centerpiece of his presidential campaign. A Tesla factory in China would most likely sell cars to that market only, allowing them to avoid the 25% tax on overseas purchases and keep pace with some of its more affordable competitors. Moreover, Gerber argued that Trump will stay away from igniting any battles with Musk, especially because the Tesla CEO has invested heavily in job creation in the U.S. Tesla said it employs 6,500 people at its giant Gigafactory battery plant. Additionally, the company employs thousands more at its Fremont, CA manufacturing complex. "Elon's invested so much in the U.S.," Gerber said. "The last thing Trump needs is some kind of battle with Elon Musk." Musk recently distanced himself from the Trump administration in the wake of the president's decision to exit the Paris Climate Accord earlier this month. As a result of the decision, Musk quit two of Trump's business advisory councils, following similar moves by Disney Enterprises Inc. (DIS - Get Report) CEO Bob Iger. Musk also reportedly skipped Trump's inaugural American Technology Council meeting on Monday, AOL reports, which was attended by nearly 20 other executives, including Apple Inc. (AAPL - Get Report) CEO Tim Cook and Amazon.com Inc. (AMZN - Get Report) CEO Jeff Bezos. Expanding in China is crucial for Tesla to keep up with German car companies, which are currently "of the greatest risk to Tesla," Gerber said. German luxury carmaker BMW AG (BMWYY recently partnered with Chinese automobile manufacturer Brilliance Auto Group to open its first factory in China's Shenyang region. BMW has its own electric model, the i8, that's currently in development. Meanwhile, Mercedes-Benz parent Daimler AG (DDAIF announced a partnership with Chinese automaker BAIC Motor Co. Ltd. to make electric cars. Tesla may have a leg up over the German car companies, though, because it's farther along in production, its cars are more affordable and come with superior technology, and the personal appeal of Musk himself, Gerber said. Tesla executives recently indicated that the company is on track to meet their Model 3 production goals of building 250,000 vehicles by the end of 2017, according to Baird analyst Ben Kallo. Tesla executives also said the company may achieve a fully autonomous autopilot system within the next two years, Kallo added, while competitors are likely two to four years behind.